I spent the first year of my Environmental Management Masters program at Duke University learning about the theories and practices of community-based environmental management. I discussed the benefits of asset mapping and potential problems with the word “empowerment.” I thought about how to most effectively work with and support communities and had some practice doing so. However, it was not until I began my summer at Dogwood Alliance that I was truly launched into grassroots, community-level work. And when I say launched, I really mean it. On my second day as the Campaign Intern, I found myself in the car traveling from North Carolina to a state forest just outside of DC. I had spent the day before figuring out where to park and how to log into my email account only to find myself transported, 24 hours later, to a Civilian Conservation Corps camp in the woods surrounded by advocates and influencers in the forest protection movement. There, we spent two un-airconditioned days talking about and creating a national platform calling for expanded forest protection and an end to forest destruction and devastation. I listened as folks debated about the definition of a “forest” and lamented the injustices they’ve seen and experienced. However, I also took part in celebrations as people looked towards a just future where forests are respected for their intrinsic, not monetary, value. You can read more about the Stand4Forests summit here. From this summit, I learned a lot of new vocabulary and specifics about forest protection. But, more importantly, I witnessed passion being harnessed into something tangible — in this case, the Stand4Forests platform — and the power of working at the grassroots level. It tooks months of collaboration, conference calls, and Google Doc drafts to create the platform, and the result was a platform that addressed the concerns of frontline communities, diverse organizations, scientists, and other leaders, while highlighting forests as a just solution to climate change. Throughout this work, I was struck by how much we can get done when folks are excited about a project and feel valued in the process. Stepping outside of Stand4Forests, I saw this tenet apply to other aspects of my work, especially among Dogwood’s community members. Dogwood Alliance’s Grassroots Political Organizer Rachel Weber and I are based in the Triangle, and folks there are drawn to the Dogwood mission because they love forests.But they stay involved because of the relationship they develop with the organization, our staff, and the other folks they meet along the way. These folks are at the heart of the grassroots movement centered around forests, climate, and justice. Not only do they show up for our local events and meetings, but they consistently ask what else they can do to support our work and grow the movement. At Dogwood, we’re not working for these folks, we’re working with them, which is an integral aspect of grassroots work. And, while minority and frontline community members are still often underrepresented at these events and rallies, Dogwood recognizes this and works to address it through efforts like the Justice First Tour and the FOREST Circle. 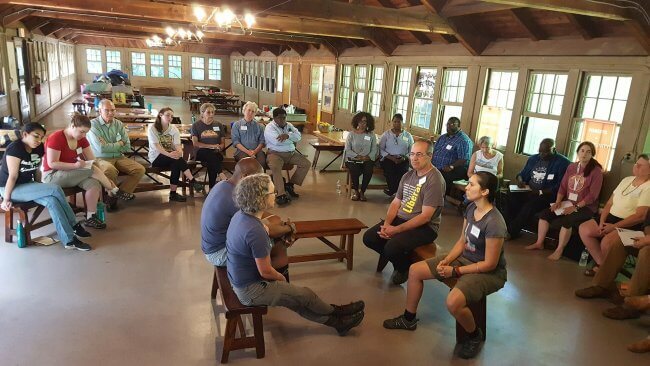 In fact, Dogwood’s commitment to integrating social and environmental justice into their work is what drew me to the organization in the first place when I attended their Stories Happen in Forests (SHIF) event with no information other than a Facebook invitation. At SHIF, people shared stories about their connections to the forest. I was blown away by the passion of everyone in the room to not only protect forests but also to include justice in the conversation. One year later, I find myself intricately involved in these efforts, learning from and with everyone in this organization. 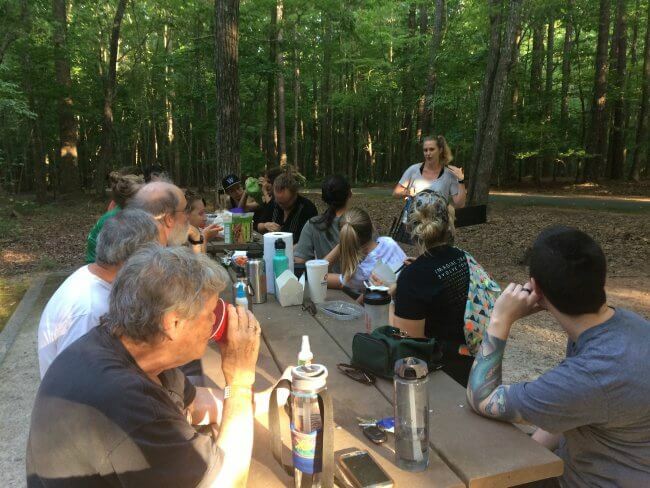 This included organizing a hike in Umstead State Park to learn more about what makes Southern forests so special and teaming up with local artist Ariana Gershman of Moon Rabbit Studio to connect art and self-care with the forest protection movement. In a healthy forest, the trees and wildlife are all interconnected and support each other. This applies to grassroots work as well. The forest protection movement is intertwined with climate, justice, and community. By working together, we’re all strengthened. If you want to be a part of this community, come out to our events — like Cheers for Trees in Durham on August 21st or Woods and Wild in Asheville on September 8th — and become a Forest Defender. Emma Fulop is the 2018 Campaign Intern at Dogwood Alliance. 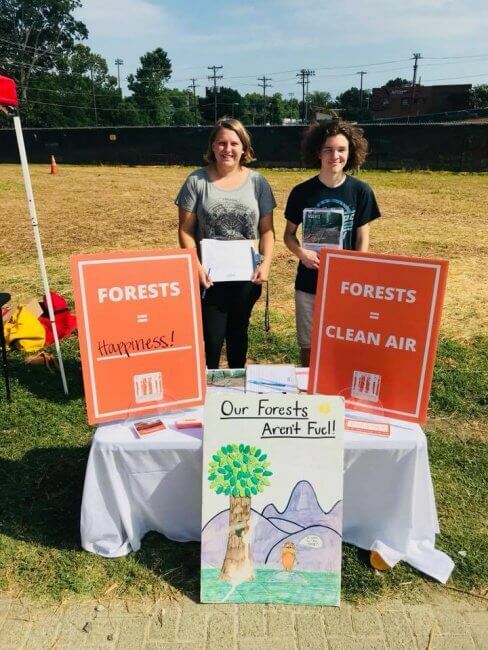 Having grown up in the forests of Tennessee and Georgia, she's excited to be involved in forest protection and advocacy. Emma is currently pursuing her Master of Environmental Management degree at Duke University, where she focuses on community-orientated strategies to address environmental injustices. Emma also enjoys taking care of her collection of house plants and visiting the many thrift stores of Durham, NC.